Turn Up the Volume… to 11! 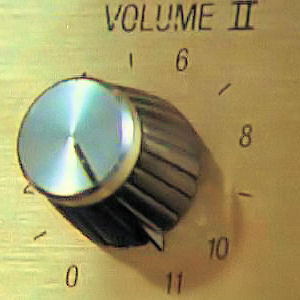 Because this show was broadcast on November 11, 2011, I decided to turn the volume way up — to 11! There is a humorous scene from the 1984 movie, This Is Spinal Tap, which stretches common perceptions of stereo settings, introducing the notion of an additional notch in the volume control. Inspired by this idea, today’s songs have a loosely unifying theme. Some have volume-related words/phrases in the titles (loud, pump up, wound up, heights, bang, etc. ); others have words related to the date; and others are just worth cranking up the volume to hear! This entry was posted on Friday, November 11th, 2011 at 6:05 pm. You can follow any responses to this entry through the RSS 2.0 feed. Both comments and pings are currently closed.